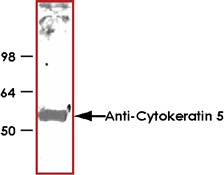 Sample Data :Western Blot analysis of HeLa cell lysates with Anti-Cytokeratin 5 (KRT5) antibody. Scientific Background :The protein encoded by this gene is a member of the keratin gene family. The type II cytokeratins consist of basic or neutral proteins which are arranged in pairs of heterotypic keratin chains coexpressed during differentiation of simple and stratified epithelial tissues. This type II cytokeratin is specifically expressed in the basal layer of the epidermis with family member KRT14. Mutations in these genes have been associated with a complex of diseases termed epidermolysis bullosa simplex. The type II cytokeratins are clustered in a region of chromosome 12q12-q13. 1. Bertheau,P., Turpin,E., Rickman,D.S et,al Exquisite sensitivity of TP53 mutant and basalbreast cancers to a dose-dense epirubicin-cyclophosphamide regimenPLoS Med. 2007:4 (3), E90.